Given Boston’s reputable role in scientific research and innovation, as well as its presence as a global biopharma hub, this annual event has become recognized by the life sciences community as an annual catalyst for information exchange among globally minded research and business professionals. In its seventh year running strong, this must-attend program addresses core topics of interest for companies at different stages of growth, and offers networking opportunities for biopharma professionals. mRNA company Moderna Therapeutic has recently set the record for largest biotech IPO. 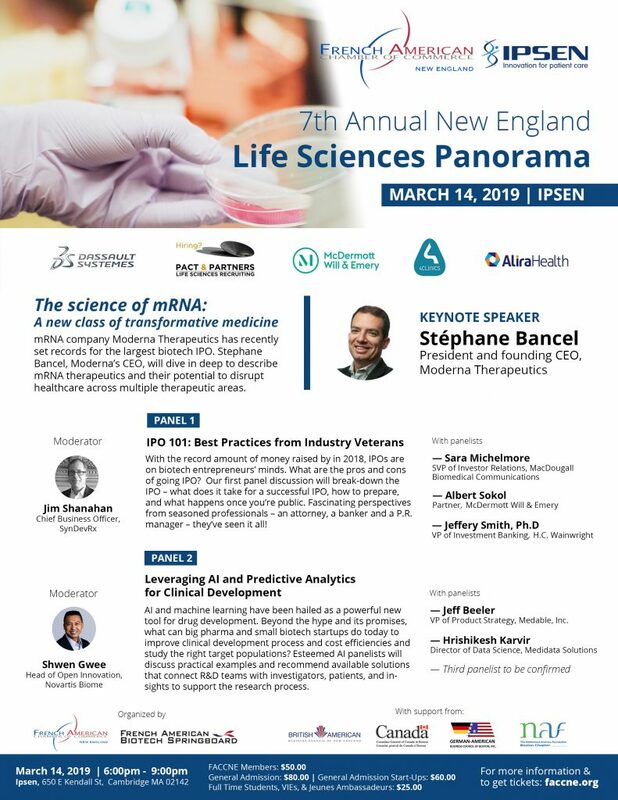 Stephane Bancel, Moderna’s president and founding CEO, will dive in deep to describe mRNA therapeutics and their potential to disrupt healthcare across multiple therapeutic areas. Will mRNA fulfill its promise as the next therapeutic platform? Unlike the traditional therapeutics (small molecules and biologics), mRNA carries instructions for the body to produce proteins necessary to prevent or fight disease. What is the potential of mRNA as a medicine? Which diseases could it be leveraged for? With the record amount of money raised by in 2018, IPOs are on biotech entrepreneurs’ minds. What are the pros and cons of going IPO? Our first panel discussion will break-down the IPO – what does it take for a successful IPO, how to prepare, and what happens once you’re public. Perspectives from seasoned professionals – an attorney, a banker and a PR manager – they’ve seen it all! AI and machine learning have been hailed as a powerful new tool for drug development. Beyond the hype and its promises, what can big pharma and small biotech startups do today to improve clinical development process and cost efficiencies and study the right target populations? Esteemed AI panelists will discuss practical examples and recommend available solutions that connect R&D teams with investigators, patients, and insights to support the research process. — Jeff Beeler, VP of Product Strategy, Medable Inc.